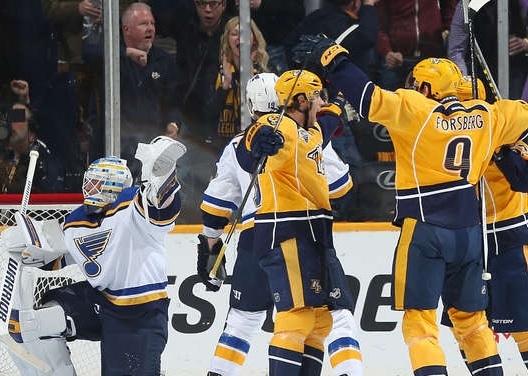 Filip Forsberg’s second natural hat trick in the past three games and Pekka Rinne’s fourth shutout propelled the Nashville Predators to a 5-0 win against the St. Louis Blues at Bridgestone Arena on Saturday. Forsberg scored three times in the second period, his 24th, 25th and 26th, equaling his total from his rookie season last season. Forsberg gave the Predators a 2-0 lead 54 seconds into the period on a rebound. Forsberg made it 3-0 lead 5:39 and then 4-0 14:49 on a one-timer from the left faceoff circle on the power play. St. Louis (35-20-9) has lost three games in a row in regulation for the first time this season. Goaltender Pheonix Copley made his NHL debut, replacing Allen in the second period. Allen made 19 saves; Copley made five saves.